Just 10 minutes’ drive from Rockhampton city centre, Comfort Inn Rockhampton City is a short 2-minute drive from Centre Plaza Rockhampton. The Rockhampton Golf Course and Rockhampton Botanic Gardens are each 8 minutes’ drive away. 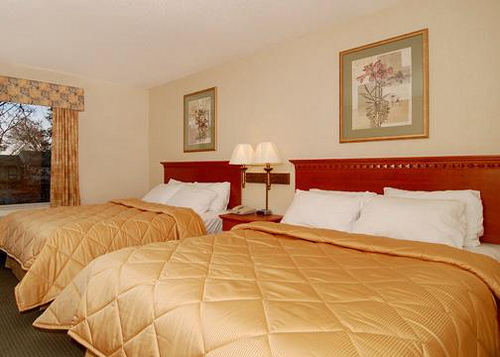 Being centrally located, the motel is a few minutes’ walk from city mall, banks, shops, government and corporate offices. Located off the highway, the motel has 44 quiet rooms and it offers its guests with many luxuries such as a private pool, air-conditioning, undercover parking, room service, off street parking for large vehicles and boats, ice machine, truck parking, onsite laundry, and bus parking. It features an outdoor pool and free Wi-Fi. Guests can also enjoy an on-site restaurant and bar. There is a BBQ area around the pool. All rooms are comfortable and spacious and offer cosy accommodations that are well furnished and equipped with standard amenities including tea and coffee in every room, Foxtel and many more. All rooms offer a flat screen satellite TV, a refrigerator and tea/coffee making facilities. Some feature a spa bath and CD player. The different types of rooms available at the hotel are Standard Double or Twin Room, Family Suite, Deluxe Double or Twin Room and Executive Double Room with Spa Bath. The hotel offers in-house conference facilities, a function centre and data points in several rooms. The conference facilities are flexible and affordable and can accommodate up to 60 people. The facilities provided include data projector, microphone and speaker, DVD player, Flip chart and whiteboards. Other equipments are also supplied on request. The in-house, fully licensed Albert’s Restaurant offers delectable food in a relaxed, friendly atmosphere. This a-la-carte restaurant and cocktail bar also provides good service and guests can have a good time, dining and wining there. A variety of different menu options are available such as working lunch in the conference room or in the restaurant, simple morning or afternoon tea to rib fillet steak or barramundi. Food is also delivered in the room through room service. A variety of seafood, steaks and light snacks are also served at the restaurant. The hotel also offers BBQ facilities and undercover parking for boats and trailers. Guests at the hotel have many entertainment and activities’ options such as exploring the Archer Park Rail Museum, taking Rockhampton Ghost Tours, visiting Rockhampton Art Gallery, C. Q. Military & Artefacts Museum, Pilbeam Theatre, Rockhampton Botanic Gardens and Zoo, Kershaw Gardens, Nissan Navara Arena, Rockhampton Golf Club, Rockhampton Heritage village, Mount Archer, Dreamtime Cultural Centre, Kenrose Park, Stocklands Shopping Plaza, The bearded Lair, The Handmade Expo Market, Gamers Lounge Cafe, Strutters Rockhampton, The Ginger Mule, and Sky Seafood. Besides the in-house restaurant, guests at the hotel have a wide choice of restaurants nearby including Cafe Bliss, Coffee Star Cafe, Delizie, Stirling Six & Co, Restaurant 98, Miss India, Riverside Restaurant, The Edge Restaurant, Degani Bakery Cafe, Archer Park Motel Restaurant, Malaysia Hut Restaurant, Ribs and Rumps, Brunswick Hotel, Giddy Goat Cafe and Bar, Blue Truffle Gourmet Deli, Sunshine Kebabs, Chango Chango, Thai Tanee, Stonegrill Restaurant, Punjabi Indian Tandoori Restaurant, Bush Inn Bar and Grill, Renny’s Cafe, Pacino’s Italian Restaurant, Rockhampton Leagues, Victoria Tavern, Pacino’s, Wah Hah Chinese Restaurant, Park Avenue hotel Motel, Saigon by the River among others.